This article looks at the various types of old carved club from the Pacific. It has lots of images to help readers identify where their war club comes from and what it is worth. Old carved club are quite beautiful in their own right and are a highly collectible form of tribal art. They are not only collected by militaria enthusiasts and the very best clubs can be worth tens of thousands of dollars. I buy old carved club and if you have a war club to sell please feel free to contact me. If you own an old South seas island club and want to know what it is worth please feel free to send me a JPeg. I would love to see it. Other offensive weapons used in Oceanic warfare include spears, bows and arrows, slings and bone daggers. There are a huge variety of forms of Pacific island War Club more so than any other weapon. Polynesians trained from a young age to use war clubs and in places, club fighting became almost a martial art. Youngsters spent hours mastering the arm, body and foot moves necessary to use various types of war club effectively. Each Polynesian culture had distinctive club styles. It is possible to determine where a war club has come from by its shape and form. In other areas of the Pacific Like New Guinea and the Solomon Islands warfare was also ritualized but with projectile weapons and shields. The majority of the Hawaiian Clubs that come to the market are reproductions or later examples. A good early example though is worth a small fortune. They are the only Polynesian clubs to have shark teeth but should not be mistaken with Micronesian clubs that also have shark teeth. Nowhere in the Pacific were old carved club more revered than in Fiji. There are so many different forms of Fijian War Club that I have an article dedicated to them. 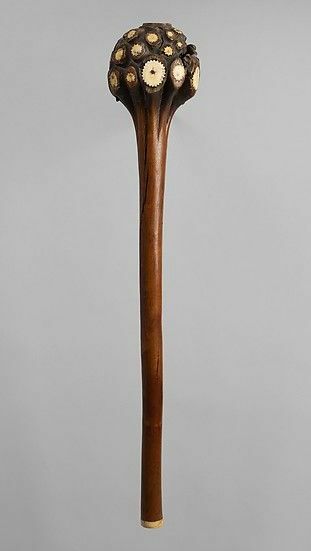 The majority of Polynesian war clubs that come to the tribal art market are Fijian, especially prevalent is the small throwing Fijian Ula. 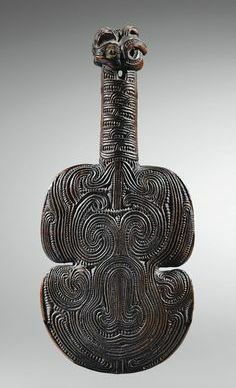 Fijian Clubs of unusual shapes and with ivory inlays or carved all over tend to be the most valuable. Easter Island Clubs are the only clubs to have eyes made with bird bone and black Obsidion. There are some later examples on the tribal art market but they are fairly easy to spot. The face on the club is on both sides in a janus style. There are two types. A long fighting club similar in proportion to a Maori Tiaha. This club is round on the shaft tapering to a spatula end. They are rare and sort after by collectors. The U’u club from the Marquesas islands is one of the holy grails for collectors of Oceanic Tribal Art. They are extremely finely made and decorated with faces as the eyes. The clubs are carved from a dense hardwood. There is very little variation in the shape or form of this type of club. If it looks substantially different to the one in the photos it is probably a later and much less valuable example. These clubs were not just a weapon. they were a status symbol. An object that defined your status as chief. It is because it is a status symbol that so much work and superb craftsmanship is placed in a single weapon. These large heavy almost spear-like clubs have various head shapes as shown. They are all made from an extremely heavy hardwood and are very collectible. Rarotongan pole clubs seldom come onto the tribal art market but when they do can go for large sums. They are almost all stone carved and the large broad-headed variety the most sort after. Pole clubs were capable of being thrust like a pike as well as slung like a club. The Maori were also prolific club makers and created a range of long striking clubs and short stabbing clubs. They were one of the few Polynesian cultures to regularly make clubs from stone and Whalebone. I have a separate article called Weapons of the Maori. Niue War clubs are long being between 140cm and 180 cm. There are several different types but most are like the one on the Left. They have a simple but very graceful form and are collectible as art objects as much as war clubs. Niue was once called the savage islands. The Niuean warrior would attack his enemy by throwing stones located in his war girdle to knock him down. Once down, the victim would die on the sharp end of a club. There are a variety of different clubs from New Caledonia. The two shown here are the most common to come onto the market. Clubs from New Caledonia are recognizable from the bottom of the handle which flares to a slightly wider diameter. New Caledonia is technically melanesian but the clubs are more Polynesian in style wood and patina. Tongan Clubs are one of the most collected of the Polynesian club and favored by tribal art collectors due to the superb workmanship. Good old Samoan Clubs are few and far between. Newer 19th century clubs are quite common and not very valuable. For ecery old genune samoan club there is 100 later copies. Even the copies are a hundred years old they just are not worth much. Without knowledge of the different club types, it is very easy to mistake a New Guinea War club or a Solomon island War Club for a Polynesian war club. If you have a strange war club and want my opinion then please just send me some images. If this post has been informative please take the time and make the effort to share it on social media. By clicking any of the share buttons below you create a link from your social site to this article. Links are what Google uses to calculate what information on the web is useful. By sharing this article you are letting Google know you found my article/images of some value. Thanks!